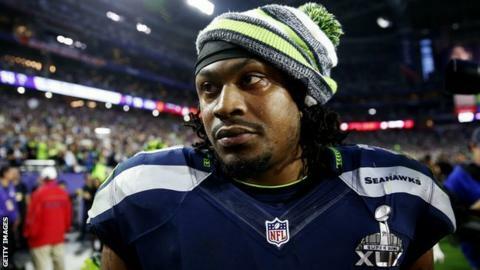 Seattle Seahawks running back Marshawn Lynch will not be fined over his behaviour at a Super Bowl media day. Lynch, whose Seahawks side lost 28-24 to New England in Sunday's Super Bowl in Arizona, answered every question from the media with "I'm here so I won't get fined" or a similar remark. An NFL spokesman said Lynch, 28, "complied with his obligation to attend all required media sessions". Lynch also escaped a fine for wearing a cap bearing his "Beast Mode" logo. The NFL ruled that the cap Lynch wore in front of the media was provided to him by an official NFL licensee and was in the colours of the Seahawks team. The former Buffalo Bills player has previously been fined $100,000 for refusing to speak to the media after games and has been fined twice this season for making an inappropriate gesture after touchdowns. Is patriotism pivotal to Test rugby? Read more on Six Nations 2015: Is patriotism still important in international rugby?